These award winning scrumptious bars are a clever combination of seriously healthy vegetables, plants, algaes and friendly bacteria infused with the natural sweetness of raw dates and creamy smooth raw almond butter. SKU: BA111. Categories: 14 day forgotten, 3 day forgotten, 5 day forgotten, 5:2 forgotten, 7 day forgotten, During Your Juice Programme, General forgotten, SOS Bars. You can now grab a guilt free snack full of healthy goodness! Juice Master’s Juice SOS Veggie Juice in a Bar is here. A snack bar made with dates, almonds and juiced vegetables. These scrumptious bars are a clever combination of seriously healthy vegetables, plants, algaes and friendly bacteria infused with the natural sweetness of raw dates and crushed almonds. 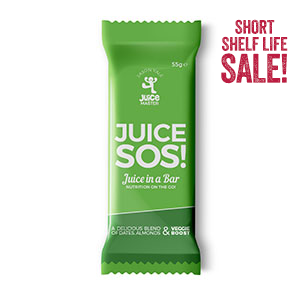 Vegan Advisory: Juice SOS Veggie Bars: Unfortunately, milk has been listed incorrectly as an allergen in the ingredients listing on the wrappers. This error occurred due to the fact that the Veggie bars contain lactobacillus. Often the lactobacillus is grown on a dairy medium, but the dairy is removed in processing. For vegans, knowing that most lactobacillus is initially grown on a dairy medium, yet ubiquitous in nature, the suitability of this product becomes a personal choice. Please note all our snack bars are manufactured in a factory that handles other milk products.